Fresh from Peru's Sacred Valley, Awamaki Lab returns with a second collection of knitwear that bridges the divide between modern design and Old World craftsmanship. As part of a four-month residency, recent Parsons graduates Courtney Cedarholm and Andria Crescioni uprooted themselves to historic Ollantaytambo, where they worked with a cooperative of Quechua women weavers to develop garments using traditional Andean textiles and techniques. The 13-piece capsule line, which launched at a trunk show in New York City on Friday, will be on view at the Textile Arts Center through Monday. Together, the duo spent their first month sketching, buying secondary fabrics from Lima, and getting to know the artisans who would be their partners in the design process. Their time was anything if not hands-on. Crescioni and Cedarholm immersed themselves in local lore, including the identification of plants that served as the basis of their vibrant, all-natural palette. Crescioni and Cedarholm crafted their collection from domestically sourced cotton, baby alpaca wool, and dyes from local flora and fauna. Marrying their respective skills in weaving and knitting, Crescioni and Cedarholm crafted their collection from domestically sourced cotton, baby alpaca wool, and dyes from local flora and fauna such as chilka, qoli, and the ground shell of the cochineal beetle. “We stuck with what made the most sense being in Peru and sourcing from Peru,” Crescioni, who won Loomstate’s zero-waste challenge nearly a year ago, tells Ecouterre. The landscape of the Patacancha Valley provided a guerdon of inspiration, as well. Almost immediately, the pair noticed the contrast between Quechua traditional dress and the tourists’ colonial-looking garb. Researching expedition images from the early 1900s, along with historic Peruvian styles, they began honing the concept behind their collection. Riffing off Cresconi’s zero-waste anorak for Loomstate, the collection is defined by both style and functionality. Working with a limited budget and only local materials proved a fruitful challenge. The final garments are surprisingly close to the original sketches, something that doesn’t happen often in fashion and a testament to the research the designers conducted before digging in. Riffing off Cresconi’s zero-waste anorak for Loomstate, in particular, Awamaki Lab’s newest collection is defined by both style and functionality. 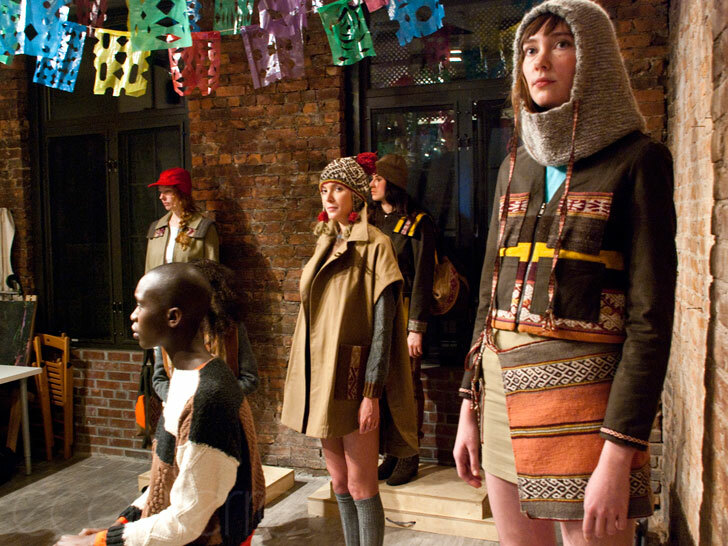 Each piece pays homage to Quechua culture with a tongue-in-cheek twist. The “Wiqaw” (“waist”) dress is belted, for instance, while the “Chakra” (“inherited land plot”) sweater offers a bird’s eye view of the landscape. True to its name, the “Tusuy” (“dance”) dress is a fun, shorter dress. Together, the duo spent their first month sketching, buying secondary fabrics from Lima, and getting to know the artisans who would be their partners in the design process. Their time was anything if not hands-on. Crescioni and Cedarholm immersed themselves in local lore, including the identification of plants that served as the basis of their vibrant, all-natural palette. Marrying their respective skills in weaving and knitting, Crescioni and Cedarholm crafted their collection from domestically sourced cotton, baby alpaca wool, and dyes from local flora and fauna such as chilka, qoli, and the ground shell of the cochineal beetle. “We stuck with what made the most sense being in Peru and sourcing from Peru," Crescioni, who won Loomstate's zero-waste challenge nearly a year ago, tells Ecouterre. Almost immediately, the pair noticed the contrast between Quechua traditional dress and the tourists' colonial-looking garb. Researching expedition images from the early 1900s, along with historic Peruvian styles, they began honing the concept behind their collection. Riffing off Cresconi's zero-waste anorak for Loomstate, in particular, Awamaki Lab’s newest collection is defined by both style and functionality. 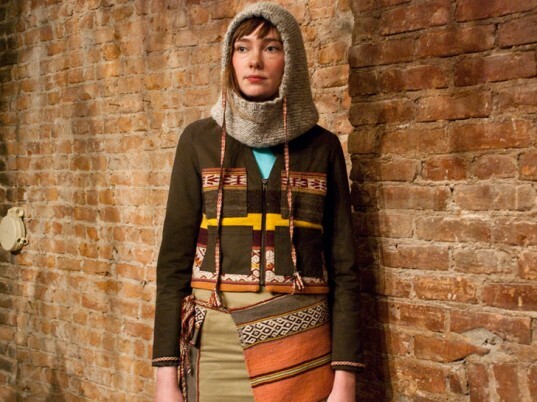 Each piece pays homage to Quechua culture with a tongue-in-cheek twist. The "Wiqaw" (“waist”) dress is belted, for instance, while the "Chakra" (“inherited land plot”) sweater offers a bird’s eye view of the landscape. True to its name, the "Tusuy" (“dance”) dress is a fun, shorter dress. Crescioni describes the person they designed for as "someone who is definitely fashionable but also wants to buy the clothing and work in it." Awamaki Lab made its debut in 2011 with a series of one-off pieces designed by Neili Vallin in collaboration with Annie Millican, the program's director. Using profits from the launch, Millican decided to switch gears and extend the reach of its wares, increasing market access and creating a reliable source of income for the artisans. With the help of Nayantara Banerjee, the "Williamsburg Seamster, and pattern-maker Hannah Flor, Millican also established a sewing cooperative for the Quechua woman, many of whom lost their homes in the January 2010 floods. The designs retail from $120 to $500.